The Mask transformation nodes create an effect on a mask. They adjust the values and ranges of input masks in various ways. Change size: This node changes the size and resolution of a mask. 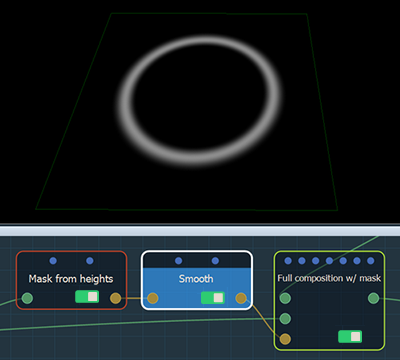 Smooth: This node smooths the values of a mask to introduce a blur. Invert: This node inverts the values of a mask. Reduce: This node transforms a mask so that it has only two values: 0 (black) and 1 (white). Min & Max values: This node modifies the minimum and maximum values of a mask. Scale and offset: This node sets the scale and offset of the mask. Apply curve: This node modifies the mask profile by changing the values of the vertices on a curve that define the mask values. Flip X: This node flips the terrain around the X axis. Flip Y: This node flips the terrain around the Y axis. Transform mask: This node modifies the first mask before it is inserted into a second mask.